The eighth Crossing Over Ceremony for “Woman,” the rites of passage program founded by Nyack College Bible and theology professor, Dr. Amy Davis Abdallah, was held Sunday, April 29 in Shuman Hall on the Rockland County campus for women who participated during the 2017-2018 academic year. 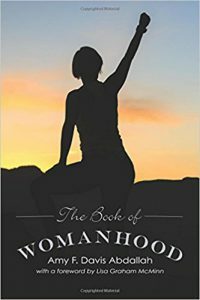 The curriculum is based on Dr. Davis Abdallah’s “Book of Womanhood,” which encourages women to find identity in developing relationship with God, herself, others and creation. President’s Hall was filled with more than the family and friends of the sixteen members of the cohort. The room was filled with anticipation and expectation…with tears and laughter. The women celebrated this year were Anna Leigh Batten, Rebecca Cheung, Hannah Childs, Olivia Susan Denny, Susannah Devenney, Rebecca Dominguez, Aileen Mehboob, Abigail Lawson, Nikole Morales, Katalina Rose Padilla, Leila Pierre, Kyra Powell, Elizabeth Redekop, Christine Rosa de Freitas, Anna Russell, Xelena Santiago and Anna Shaffer. As diverse as their personal backgrounds is the broad range of disciplines they have studied at Nyack. Degree majors include intercultural studies, pastoral ministries, psychology, biblical and theological studies, business administration, English, social work, childhood education, and nursing. The presentations—original songs, monologues, paintings, collages, pottery and tiles—were evidence of how the program fosters a personal transformation that takes place in each student who engages the journey into womanhood.